So after painting the rumpus room, I jumped right into painting the guest room the following week. At this point there was barely a month until the Halloween Housewarming Party and no time to waste. Luckily for me most of the room is painted a nice sort of periwinkle blue, so the only thing I wanted to paint over was the lime green nook in the back. I love the things in this room. The orange seashell chair I picked up a couple of years ago at a super fun vintage store in Cleveland called Flower Child. The rug, like most of the rugs in my house, is an indoor/outdoor rug that can easily be hosed off if a cat does something disgusting to it. The vase I got in Romania at a road-side craft stand. The peacock comforter is Anthropologie. The blue-framed mirror I got at Ikea a million years ago. The nook is the exact same size as a full-size bed, which means making the bed is terrible, but it’s the perfect little cubbyhole for sleeping. Remember this photo I posted a while ago from the Anthropologie catalog? 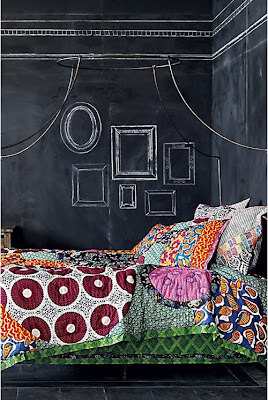 Taking inspiration from it, ultimately my plan is to draw maybe a headboard, maybe a bedside table on the chalkboard walls… I have a ton of ideas.